Originally, attenuation circuit only served as an outlet for my own music, which nowadays is presented at http://emergeac.wordpress.com/. Since 2011, I have been focusing on connecting the experimental music scene at my Augsburg homebase – which I helped establish as part of the team behind the concert series “echokammer” – with the international experimental underground. In 2015, attenuation circuit is entering its second phase, which means the shift from downloads and limited editions to professional, factory-pressed CDs and vinyl. The financial situation is stable in so far as by now only very limited private subsidies are necessary, but attenuation circuit clearly is a not-for-profit operation. The exposure gradually increases and I get a lot of positive feedback, even though getting recognition from magazines and mailorders is difficult due to the high number of releases competing for attention. There is so much music around today that nobody can keep track of everything. A good label acts as a curator with a convincing profile and focus of interest, providing its listeners with music that is not necessarily all from the same genre, but consistently interesting. The value of the label lies in the curating role I just mentioned, precisely because there is more and more music around by artists that nobody knows and therefore does not find on the web. But as we are not profit-oriented, we do not have a problem with artists putting out their own material. Direct releases basically fulfill the same ideal that also motivates attenuation circuit: That it should be possible to get music across to listeners in all possible ways without being constrained by certain commercial formats. The selection and marketing of musical content becomes the central task of the label. Manufacturing records and distributing music take second place in that these are things that artists can easily do on their own today via various platforms. Our new label website is an example: I have shed the job of providing digital downloads of the back catalogue and outsourced it to Bandcamp because they already provide a perfectly usable facility for this task. Our own site attenuationcircuit.de focuses exclusively on the front list of physical releases. This gives me the time to focus on the core task of finding and acquiring new music to develop the catalogue. How important do you rate the importance of distributors (including mail orders and outlets for digital downloads) for a label like yours? How hard has it been for you to find and work with distributors? What, do you feel, could be improved in this regard? Distributors are very important because it is very hard for a one-man operation like attenuation circuit to provide all the digital and analogue logistics on one’s own, as I just mentioned regarding Bandcamp. In terms of finding distributors for physical releases, attenuation circuit has had great support from Drone Records – where I had already released my own music before I started the label – from the very beginning. As for contacting new distributors, I would find it very helpful if more distributors offered a standardised procedure for submitting material. Facebook and Bandcamp, and to a lesser extent Soundcloud, are crucial to my work. Building Facebook friendships with artists and posting new releases in Facebook groups related to our music are my most important tools for spreading the word about new releases, and take an important share of the time I spend working for the label. We appreciate it when journalists accept digital press kits of releases for review (rather than a physical copy), that is, a download link to the complete release including the artwork. From your experience, has playing live – or organising live events – really, as many have claimed, been a positive factor for your label? How would you describe the relevance of a direct communication with fans and supporters? As I mentioned earlier, organising live events and the resulting contacts with artists actually inspired the label in its present form, so in our case the label is inseparable from my live activities both as an organiser and an artist. My experience fully confirms the positive impact of live events on the label. After a concert that impressed them, audiences tend to buy experimental music they would not otherwise buy, and when I play live shows, this gives me an additional opportunity of showcasing releases by label artists alongside my own releases. Are artists expecting too much from a label, would you say? How important is their own contribution – in terms of promotion, for example - to the success of a release? When I discuss potential releases with artists, I make a point of avoiding disappointment by making it very clear from the start that attenuation circuit is a non-commercial venture from which they cannot expect any money. Once this is agreed upon, artists usually feel very positive about the recognition they get from the label in the form of, for example, complete artistic control over the artwork and generous amounts of free copies. And it certainly makes a difference to the success of a release when artists share their releases through their digital networks or sell records on tour. How do you define success for your label? I want to expose listeners to exciting music by artists I love. In terms of artistic profile, it has been a particular success for me that artists whose work I have admired and collected for a long time have released work on attenuation circuit because they found that the label represents them very well. Music-sharing sites and -blogs as well as a flood of releases in general are presenting both listeners and artists with challenging questions. What's your view on the value of music today? Music is everywhere, so it becomes harder for listeners to decide what to listen to consciously, and what to spend their money on. Also, digital technology enables more and more people to create their own music, so perhaps we are on the way to an economy of trading music against other people’s music rather than selling it. Another indicator that perhaps the social value of music is taking precedence over its commercial value is the increasing interest in live music. How do physical sales and (authorised) digital downloads compare in terms of income for you? Do you see models like Spotify as a problem or a potential solution? Physical sales clearly generate the largest share of our income. Spotify and the like are commercial models without any relevance for the underground scene in which we work. But the possibility of streaming whole tracks via Bandcamp is a very good way for listeners to discover our kind of music, for which sound bites of a few seconds are simply not representative. We appreciate the fact that streaming gives listeners more freedom in choosing how they want to listen to music. In how far do you see artful packaging as a way forward for you as a label? Are the objectification and value of music inherently related to each other, would you say? Distinctive, recognisable design with artwork by a core team of artists, such as painter Tine Klink and photographers’ collective Brezenstudio, has been crucial in putting attenuation circuit on the map as a label with a recognisable, well-considered profile. Limited editions with hand-painted covers, with each copy of the record packaged in a unique work of art, have created a reputation for us beyond the musical underground scene and even earned us a place alongside internationally renowned designers in Stuart Tolley’s book “Collector’s Edition”. In general, I am convinced that an increasing number of people, including young ‘digital natives,’ feel a need for touching music in the form of an object, which may also explain part of the renewed interest in the tape cassette. From your perspective, what would be a workable model for the future for listeners, artists and labels alike? Artists and labels must work to create an experience not only through the composition of the music, but also around it – in the form of great live shows and lovingly curated releases, for example – to make their work an experience to be remembered by listeners. People are exposed to so much music today that added visual, social, and otherwise experiential value is crucial if a piece of music is to earn a lasting place in their lives. 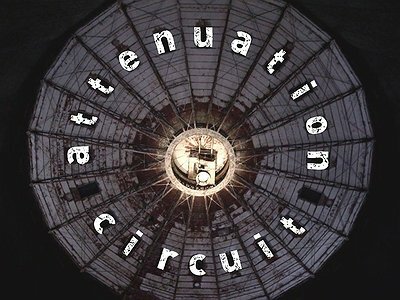 Visit the Attenuation Circuit website or the Emerge / Attenuation Circuit bandcamp page to order directly from the label. "People are exposed to so much music today that added visual, social, and otherwise experiential value is crucial."